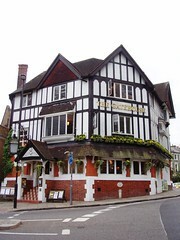 The Gatehouse was a Wetherspoons pub in Highgate. It closed in early 2016. As of April 2016 the premises are occupied by a gastropub which, confusingly, keeps the pub's historical name of the Gatehouse. This landmark building at the top of Highgate Hill is inside a heavily wood-panelled pub, with booth and table seating around a large central bar and entrances on either side of the building. There's also a dining room down stairs to the rear. In winter, an open fire warms the building. At the bar, there are several banks of handpulls, with the usual good range of ale and some ciders. Draught taps dispense Blue Moon, Leffe, Staropramen (£3.45/pint) and others. The standard Wetherspoon's menu is in operation, and the food is of a consistent quality to other pubs in the chain. Ewan visited on a Tuesday 'steak night' and enjoyed his rump steak (on a two steaks plus a bottle of wine for £16 offer), which was cooked medium rare as requested, and was not as chewy and unpalatable as he'd initially feared. The bottle of wine was also decent. Upstairs is a theatre holding around 100 which puts on plays and musicals throughout the year. Ewan saw a production of Guys and Dolls there and enjoyed it immensely. Last visited by Ewan and Kerry, January 2012. Last edited 2017-02-05 19:18:25 (version 22; diff). List all versions. Page last edited 2017-02-05 19:18:25 (version 22).